Subject matter experts know their subject matter. That’s why they’re called experts. But they don’t always know how best to teach what they know, especially when it comes to elearning. Subject matter experts offer a lot of value when it comes to building your elearning courses. They have invested lots of time in developing their expertise so they’re able to touch on nuances that go beyond just information. This can be critical in your course design. However, there are some challenges when working with experts. Often they’re so far removed from the learning process and where a new person is that they lose perspective on what is most essential to learning new skills. Trying to get the right information and structure for your course can prove difficult. I find that many of them consider all of the information critical. I’ve worked on projects where it was almost impossible to get the subject matter expert to concede anything. This can be both frustrating and time-consuming. There were times I wished I had an elearning mediator who could talk to the subject matter expert in a way I couldn’t. People don’t care about what you know as much as you do. I know this sounds harsh but it’s just the way it is. What people care about is learning what they need to learn to meet their goals. If you have something to offer that’s good; but it’s really just part of a pool of information and experiences that they encounter. So what you know has value, but only as it matters to them. New learners don’t need to know everything you know. Your expertise comes from years of experience. You didn’t just read a manual and become an expert. You had a lot of opportunity both formal and informal to develop your expertise. Keep that in mind when working with new learners. Your actions speak so loud I can hardly hear you. My boss used to say that to me all the time when I talked about what I knew. She was less concerned about my talking and more on my doing. This could also be applied to elearning and subject matter experts. Instead of telling me what the new learners should know, tell me what actions they should be able to do. Then we can set a plan around actionable goals. Sometimes my wife accuses me of giving her long answers to simple questions. She always tells me, “I ask what time it is and you begin to tell me how to build a clock.” I only do this because if something should ever happen to me, I’d like her to be able to build a clock so she’s always know what time it is. There’s a lot of truth to what she says. I find that I like to pad my answer around context. So instead of giving a simple answer I ramble on offering all sorts of contextual nuance. And that tends to be a problem common to working with subject matter experts. Their experience isn’t based on black and white solutions. Instead they’re nuanced based on variables that they’ve learned to master over the years. Context is important to an expert. But it’s not always relevant to a new learner. Our job is to expose the critical information but work around some of the context that a new learner might not easily understand. Here are a few tips when working with subject matter experts to build elearning courses. I’ve also included links to previous posts that may help. Create courses that are learner-centric. Instead of focusing on the information, focus on how the learner will use the information. This helps build the context that is so critical to gaining expertise. Get to know your learners to build the best course possible. What do your learners want to do? Focus on action. Going with the point above, figure out how the learners will use the information. Then frame the course around that. There are simple ways to do so. For example, create scenarios or case studies that are relevant and meaningful. If you’re teaching a policy, instead of presenting the policy, create a real world situation where the policy applies. Then walk them through a scenario where they get to make decisions and get feedback based on how they apply the policy. I recommend pulling in recent learners—people who’ve just learned what you’re trying to teach. They can offer some insight and perspective that is meaningful. Get rid of some of your content and focus on performance. Create scenarios to engage your learners. Simple way to build interactive scenarios. Get the learners to pull the information. Most elearning courses I see push the information out. This isn’t bad or wrong. In fact, I kind of view an elearning course like a text book. So pushing information out isn’t a bad way to go it’s just not always the best way to go. Some text books just present information (like a lot of elearning courses); however some included questions and case studies. They pose questions that get you back into the text looking for information and then using it to solve problems. In the same sense, build your courses in a way that the learner is compelled to pull information from the course to solve problems. Create courses where the learner pulls information. Give your learners an opportunity to explore. Help learners create meaning out of the information you share. ds and you’ll be off to a good start. What tips do you have when it comes to working with subject matter experts? Click here to share them. Good post. The three tips make sense from a learning science point of view. Recommended this post in http://coredogs.com/blog/helping-experts-build-e-learning-courses. Could be hard to convince experts that they might be expert in the subject matter, but not in learning. Suggestions on how to do this? Might be worth another post. Thank you, thank you, thank you, thank you!!! Thank YOU. Perfect entry. Now it’s time to share some knowledge. Great ideas and spot on! 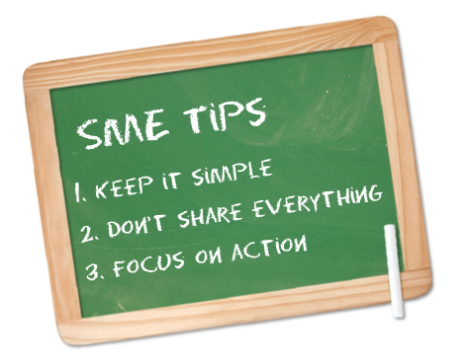 It’s true that SMEs often want to share everything they know. I’m guilty of it, too, when I’m in a SME position, so I guess I understand. I try to get my SME to talk to me, as a real person, perhaps on the phone, instead of writing it all down. Record it (I use a handheld digital recorder) and summarize for them. Few people like to see edits to their written work. I also use case studies or stories of real people/situations often. I just finished interviewing managers of online professional development programs for educators from across the country. One great tip I learned was including a third person on the design team as a manager, perhaps including someone from the funding agency. That way, there’s always a 3-way vote, not just a 50/50 split. I’m sitting here roaring! A co-worker and I have been working for a couple of months to pull together a PPT job aid for SMEs covering a lot of what you said. Anything we missed in your article will become a major point. Thank you, thank you. I wish this could be mandatory reading for every SME in our corporation! I wanted to share an excellent article written by BJ Fogg called Creating Persuasive Technologies: an Eight-Step Design Process that could provide more amunition when speaking to SMEs and others. Also an extremely useful book called e-Learning and the Science of Instruction: Proven Guidlelines for Consumers and Designers of Multimedia Learning by Ruth Clark and Richard Meyer. Besides all the very practical and evidence-based stuff in here they also address the differences between ‘expert’ learners and ‘novice’ learners and how you need to adjust your material to get the best learning environment for them. Could also be useful in speaking to SMEs. Very timely post – I needed to communicate with an SME just this morning regarding content development and this post helped me direct the focus of the develop to be action-centric rather than information-centric. Thanks, Tom! These are great suggestions and I also agree with the tips John Ross provided. I would add that – when possible – pilot test a very early prototype of your work with your target audience. While working with National Wildlife Federation and the Smithsonian, I found that their scientists were experts and were often so deep in their own vocabulary and concepts that it was difficult for them to know what their audience would need to know before we could teach a key learning point. Fortunately, we were able to use volunteers to review our early drafts and provide us with feedback that could be used to create better final products. Our volunteers enjoyed the process and helped us make the learning more engaging and meaningful for others. I ask the SMEs for ‘bullet points’ and then break down what they say into steps and emphasize a “bite sized pieces” approach. And if the SME feels strongly about including some ‘context’ info I place it in the facilitator/speaker notes. The Facilitators like this approach because it gives them the ability to add the nuance in their own, practiced style and makes them a proxy SME. Yes and at the same time the problem persists because the SME isn’t going to read articles like this and will always think that the ID’s direction is coming from the ID, not from a way of working and a body of experience and knowledge on learning. Why is it that no college professor or other expert I have ever worked with has any respect at all for the idea that teaching is also a discipline, that building learning experiences is an applied art, and that I’m the SME in that? Sometimes I feel like we are the Rodney Dangerfields of the professional world. @Tahiya: it was like that when I produced video as well. Just comes with the territory. @Stephanie: good point; I also like to build quick prototypes and get “new eyes” involved. @John: good idea on bringing in the third person. I like to bring in some recent learners. Sometimes I’ll try to bring in a finance person or analyst that can pull some metrics. I find that the metrics lets us shirt the conversation to measurable activity. Brilliant (as always), thank you! I’ve posted this on the eLearning Global Giveback site – so next time around, LINGOs member agencies will have this valuable resource in working with their fabulous eLearning volunteers. Thanks, Tom! Great post as always, Tom. You know how to get a message down to its core. @Norman: thanks for the link…good stuff. I laughed out loud at “People don’t care about what you know as much as you do” because it’s so true. I was just explaining it the other day (and I know I’ve been guilty of it myself *many* times). Basically, have a knowledge repository where all that “extra” content can go. It helps if you aren’t saying “No, we can’t put that in.” but are saying “Yes – that’s a perfect item for the resource area!” instead. (blogged about it here: http://usablelearning.wordpress.com/2009/10/14/how-cartalk-can-save-your-e-learning/ ). Wonderful post! I also appreciate all the comments, and especially John Ross. We try to get our SMEs to explain the topics with a whiteboard or just a napkin, to a person who is squarely in the target audience. It is only when they see the confused look on someone’s face, or the requests for clarification that they start adding in the really good stuff… Those alternate ways of thinking about it, better analogies, etc. Then we take photos of the whiteboard and napkin drawings, and these are often what end up in our books. I have had several SMEs when I was working at Sun Microsystems — brilliant engineers whi struggled to relate to mere mortals, but who were in fact the only ones who knew some of the newest technology — that made dramatic changes when given a voice recorder, but by far the best for us was having a real person for them to “teach”. We found it too hard to convince some SMEs that we (course devs / IDs) actually KNEW what would be too confusing, but having just one person they approved as an Actual Target Audience person extracted the right things out of them… All of those “well let me try it another way” secondary explanations and FAQs that are so hard to get at otherwise. That usually helps the SMEs think in simpler terms (and helps me build a useful course). Hi. I am just know producing an e-learning update for the Swedish banking and finance industry. I’ts a mandatory early update for those having a license. We have about 10 000 people doing the update this year. I am both a producer and a SME expert. I get the difficulities from both sides so to speak. Even though I have both competences in some subjects it’s impossible for me to decide which material should be included in the course. I find it very usefull discussing with people that are not field experts and have a level of knowledge that the receivers of the course will have. I have to explain and make it easy, taking examples from real life and analogies. My recommendation is to always have a curious college that are not afraid to say that they do not understand in a room crowded with experts, otherwise no one will understand what to explain because everyone understands. Thanks for a great Blogg!!! But isn’t that the same reason why you can write excellent posts time after time in this invaluable blog! Thank-you, Tom. I ask the SME to tell me a story about a time when they used this information in real life situations. this usually brings in more usable learning points. I also ask them what they think their audience came to learn. If they don’t know I help them understand as I believe it to be. Questions seem to help better than firm directions. They like feeling as if they know the answer. 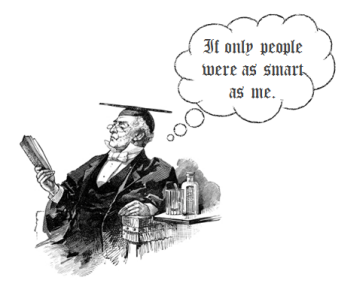 The funny thing about the cartoon at the start of this blogpost is that the caption should actually read “If only people were as smart as I.” Zing! Ha ha. Thanks again, Tom for reminding us e-learning developers about the importance of SME’s ‘sprouting’ too much detail. Less is more in a lot of cases that’s very true, especially to newcomers within an organisation. I once had a go at Microsoft Word’s ‘AutoSummarise’ command… which summarises huge documents into degrees of smaller understandings. Have you ever tried it? Perhaps we could provide something similar for SME sprouters of knowledge, no? @Keith: haven’t looked at the AutoSummarize. But something like that for SME’s would be cool. I think Cathy Moore’s action mapping approach is a great way to help SME’s get to that point, as well. @Drew: I was surprised no one else mentioned that. @Patrik: check out Cathy Moore’s action mapping. It’s a practical approach to help distill some of the content. @Kathy: good tips; I’d also bring a new learner in with the SME to help get to some of that information. I also like to do backwards design. “How can I SEE that the person knows the subject?” At this point we build around the tangible proof which helps make the focus more actionable. Another tip is to show the SME some before and after treatments so they can see the difference between the info dump and something better suited for new learners. Hey Julie D: was just talking about you…referred someone to your blog. Thanks for the link. Well said! … will be sharing this link with content developers as well as planning teams! In addition to the very insightful tips mentioned in the original post, it is worth mentioning the importance for content experts to be familiar with general learning and cognitive information processing theories. This would help bridge the communication gap between the instructional designer and the context expert. For example, it would greatly benefit a context expert to always keep in mind that one of the main goals of teaching, under a constructivist approach, is to implement scenarios where the student can transfer and apply new knowledge and skills to novel problems. Thus, learning is not about regurgitating bits of information divorced from an appropriate context. “…transfer can be facilitated by involvement in authentic tasks anchored in meaningful contexts…the context forms an inexorable link with the knowledge embedded in it…If learning is decontextualized there is little hope for transfer to occur.” (Ertmer & Newby, 1993) And of course, one of the main goals is for learners to be able to transfer and apply what they have learned in order to find solutions to novel situations. Hence, knowledge of learning and cognitive processing theories allows content experts to keep in mind that what they know is not the spotlight of teaching. The spotlight is to meet the needs of the learner. @Fernando: good comments. How would you go about getting the SME up-to-speed on some of these learning theories? Tom – fabulous post. I’m glad that you spoke to the value of bringing recent learners into the design process. I generally find that the correct balance of information lies somewhere in between the recent learner and the SME. You also spoke about wishing that you had an eLearning mediator. I find that Project Manager’s often have a good skill set to fill that role. They are able to frame the project around the triple constraints (time, scope, resources) – which often helps the SME recognize the “project” limits – and then focus their energies on what really needs to be learned. A good PM will also keep people focused on their own roles (i.e. – letting the ID design). Tom this is my first time visiting and reviewing your blogs. I have to say this post was very refreshing and very helpful. I am a technology administrator for a public school system. And I have to admit I am guilty of the same offenses you posted about. On occasion, I am required to develop and conduct face to face technology workshops for teachers at my assigned schools. While designing, I tend to be long winded, in the sense that I try to pack as much self perceived relevant content into the presentation as possible. I do realize my audiences do not need to know or even care about half the information I think is important. A contributing factor would be my audience job diversity. My audience is composed of History, Math, English, and Science teachers. All of which are only concerned about the benefits to their subject area/department. I am definitely going to put in to practice some of the tips you provided in your post. In addition, I will believe designing around metacognition theory will be of some benefit. Regulating myself, regulating the direction of the lesson and designing with “K.I.S.S.” (Keep It Sweet and Simple). First I will attempt to narrow presentation/ lesson by asking myself “What are the basic skills I want my audience to leave my training with? “ After answering that question develop 4 relevant general tasks that can be used by al teachers. Then I would explore ways that I can keep the audience engaged and ensure they are absorbing the information being conveyed. Double check myself by asking “Is this information or example relevant…Do they really need to know this information in their working environment?” In addition, I would check to make sure can I accomplish the lesson in a set time frame. Most importantly the key to designing an awesome presentation or lesson is no different from working on computers hardware or software. It involved continuous review, tweaking, and testing to get it just right. Although I only have one week’s experience with blogging, I’m quickly appreciating the benefits that come with creating a blog website. The networking opportunities and available resources are endless. As I reviewed another classmates’ blog website, I discovered The Rapid E-Learning Blog. The site offers a wealth of resources with very practical tips and suggestions. Although the nature of my job does not directly involve e-learning, the information referenced is easily translatable into a traditional classroom setting. 1. People don’t care about what you know as much as you do. 2. New learners don’t need to know everything you know. 3. Your actions speak so loud I can hardly hear you. Two days ago, I was sitting in the briefing of a SME who was so engrossed in his historical information that he didn’t realize he’d lost his audience! That SME could have benefitted from this blog. A quick review of the blog archives yielded even more helpful information. After viewing the blog, I can honestly say that my only regret was that I had not discovered this website a year ago, when I really needed it. Needless to say, I quickly subscribed to this website and look forward to reading future blogs! Thanks for all of the insightful information!! Lavorare con gli esperti di contenuto: un incubo? « Elearnit: Know How to Know!